Kimberly Hall, 54, of Lima confers with her attorney, William Kluge, during her sentencing hearing Monday in Allen County Common Pleas Court. 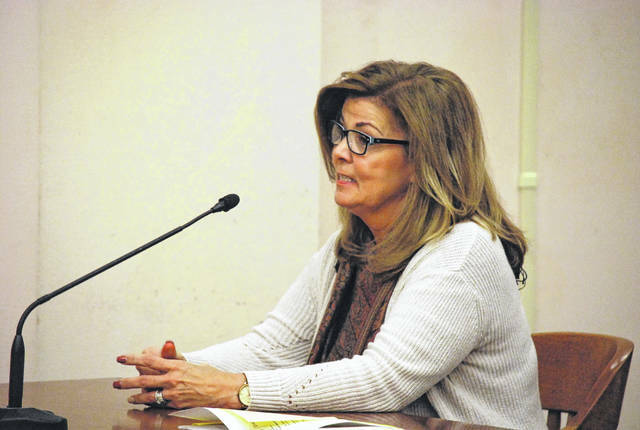 Kimberly Hall, who in September pleaded guilty to felony charges of theft in office and grand theft for stealing money from Shawnee schools and a sports booster club at the school, was sentenced Monday to two year on probation and 80 hours of community service. She was also ordered to pay back more than $41,000 to the school and the booster club. 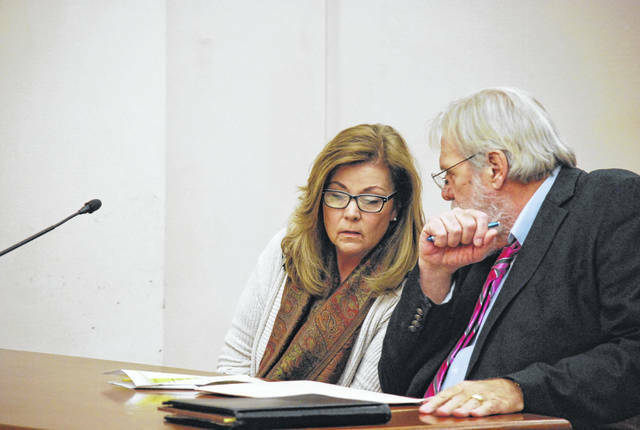 But Hall, a former facilities administrative assistant at Shawnee schools who stole more than $50,000 during her tenure there and in her position as the treasurer of the Shawnee Baseball Boosters Association, nonetheless apologized to family, friends and former co-workers during her sentencing hearing Monday morning. Hall told Reed that she and her family were receiving “threatening phone calls” related to her son’s drug addiction. “I didn’t want him to get hurt. As a mother, I guess we’ll do anything we can to protect our children,” she said. The judge sentenced Hall to two years on probation, ordered her to perform 80 hours of community service and required that $41,851 in restitution be made to the affected parties. Hall, 54, pleaded guilty in September to charges of theft of office, a third-degree felony, and grand theft, a fourth-degree felony. Prosecutors dismissed a third-degree felony charge of money laundering. Hers was the second criminal case involving theft from Shawnee schools this year. In February, Heather O’Connor pleaded guilty to one count of grand theft for stealing $42,141 from the Shawnee Middle School Parent Teacher Committee and $9,277 from the Little Indians Volleyball Association. In March she was sentenced to five years on probation, 40 hours of community service and was ordered to make full restitution.